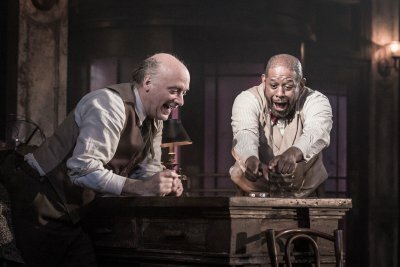 Forest Whitaker makes an impressive Broadway debut in this atmospheric revival of Eugene O’Neill’s cheerfully mournful one-act play, typical of his work. “Forgot you ain’t seen me before. Erie Smith’s the name. 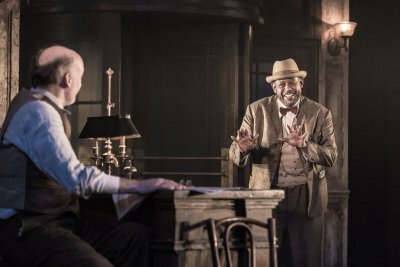 I’m an old timer in this fleabag… I been off on a drunk,” Forest Whitaker wistfully declares after making his entrance through a revolving door into a decrepit hotel lobby at the beginning of Hughie, which is his impressive Broadway debut. Mr. Whitaker has excelled as a screen actor in prominent films since 1982’s Fast Times at Ridgemont High and won the Academy Award for Best Actor in 2006 for portraying Idi Amin in The Last King of Scotland. His performance in this play is as equally commanding and admirable due to the material’s difficult nature. It’s virtually a one-hour monologue alternating between despair and comedy typical of its author, Eugene O’Neill. Written in 1942, in tone and structure it can be viewed as a miniature companion piece to the epic The Iceman Cometh and anticipates the future work of Samuel Beckett. It is the summer of 1928 between 3 AM and 4 AM in a dumpy hotel near Times Square in New York City. Eerie Smith is a single middle-aged small-time gambler, scraping by through life, who has lived there for 15 years. He’s had a warm relationship with the night clerk Hughie who died earlier in the week and whom he sorrowfully reminisces about to the new night clerk. O’Neill explores his characteristic themes of despair versus optimism and the need for illusions in order to survive in this haunting short work. With his familiar low-key persona, idiosyncratic speech patterns, expressive smile and gracefully lumbering physicality, Whitaker mesmerizingly embodies this reflective lost soul that as a type is found in many of O’Neill’s plays. When the audience enters, the curtain is up and Christopher Oram’s imposing scenic design of the faded hotel lobby is in view. The visual effect of its industrial greenish walls, dirty stone columns, chipped wooden adornments, ancient elevator, central staircase, frayed threadbare furnishings, severe front desk, and grimy windows is that of a stunning representation of hellish imprisonment. Also on view while the audience waits the play to start is the night clerk staring into space. He is played by Tony Award-winning New York stage veteran Frank Wood who subtly and laconically makes the most of this verbally spare but pivotal role. With his precise homespun delivery, intense facial expressions, and piercing eyes, Mr. Wood makes a great impression and is a strong partner for Whitaker even while sitting silently for much of the play. Director Michael Grandage has taken an unconventional approach in presenting this small-scale work by creating tremendous imagery with theatrical stagecraft that inventively and faithfully realizes the material. Mr. Grandage’s technical mastery yields arresting tableaus that combined with the impeccable performances he has achieved make the production a powerful experience. In addition to the enormous scenic design there is Neil Austin’s dreamy and striking lighting with its dim, murky and misty elements that imparts a lugubrious mood. The sound design and original music by Adam Cork includes bits of street noise giving the sense of life outside the hermetic environment. There is also Mr. Cork’s striking score that perfectly accompanies the action on stage. The detailed 1920’s clothing the two actors wear has been created by Mr. Oram, and instantly gives the sense of the characters. Hughie premiered in Sweden in 1958 and ever since the role of Eerie Smith has been a lure to a number of notable actors though these productions have been mostly commercially unsuccessful. The 1963 English premiere in Bath starred Burgess Meredith but did not transfer to London. The first Broadway production opened in 1964 to mixed notices and starred celebrated O’Neill interpreter Jason Robards and had a short run of 51 performances. Robards appeared in the play regionally for many years after and in a television adaptation of it in 1984. It was revived on Broadway in 1975 for a brief 31 performances with Ben Gazzara and again in 1996 for a limited run of 56 performances starring Al Pacino. Brian Dennehy was acclaimed in a production that played in several U.S. cities including Chicago and Canada from 2004 to 2010. This production of Hughie vividly fulfills O’Neill’s intentions with its inspired physical representation and engrossing performances.